The National Academy of Recording, Arts and Sciences made the nominee announcement. And, the nominees for the Best Reggae Album at the 2016 Grammy Awards are Rose Petals by J Boog, Falling Into Place by Rebelution, Ziggy Marley by Ziggy Marley, SOJA: Live in Virgina by SOJA and Reggae For Her by Sly & Robbie. For the voting at the Grammy’s, final-round ballots are sent to voting members in good dues standing. The finalists determined by the special nominating committees are also included in this ballot. In this final round, Recording Academy members may vote in up to 20 categories in the genre fields plus the four categories of the General Field (Record Of The Year, Album Of The Year, Song Of The Year and Best New Artist.) Ballots again are tabulated by the independent accounting firm of Deloitte. 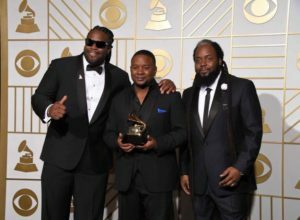 Last year’s Grammy Award for Best Reggae Album was earned by Morgan Heritage for Strictly Roots, edging out Jah Cure, Barrington Levy, Luciano, and Rocky Duwani. The Grammy for Best Reggae Album has long been a secluded fraternity, awarding Jamaican bands and artists. Steel Pulse became the first non-Jamaican band to win a Grammy for their 1986 album, Babylon The Bandit. An American reggae band has never won a Grammy for Best Reggae Album. With three of the five nominees calling the United States home, perhaps this will be the year an American-based roots-rock-reggae band will take home the crown for Best Reggae Album. To find out who takes home the award for Best Reggae Album, tune into the Grammys on February 12, 2017 live from Staples Center in Los Angeles, California. The host of the evening will be LL Cool J. The 59th Grammy Award ceremony will be broadcast on CBS at 8 PM Eastern Standard Time.